This year’s Dinner and Bikes tour will wrap up with a Chicago stop on Tuesday, June 4 at Heritage Bicycles (2959 North Lincoln Avenue). Celebrating good food and bike-riding, Dinner and Bikes is a tour that happens in May in central and northeastern U.S. The tour features authors Joshua Ploeg, Joe Biel and Elly Blue. 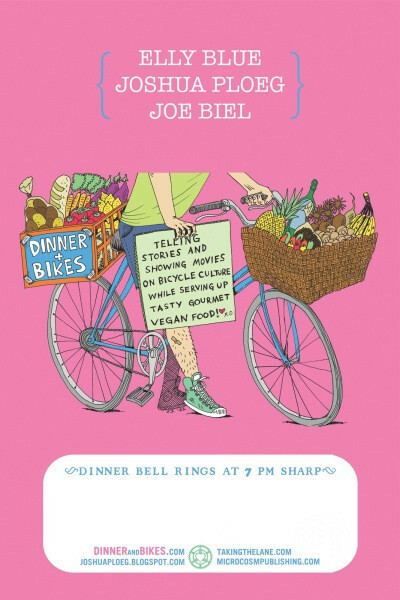 As for what to expect on Tuesday, chef Joshua Ploeg will present a gourmet vegan and gluten-free buffet dinner; Elly Blue will give an interactive presentation about bicylcing and equity and Biel will show a rough cut of a documentary he’s working on called “Aftermass,” a look at the history of bicycle activism in Portland.